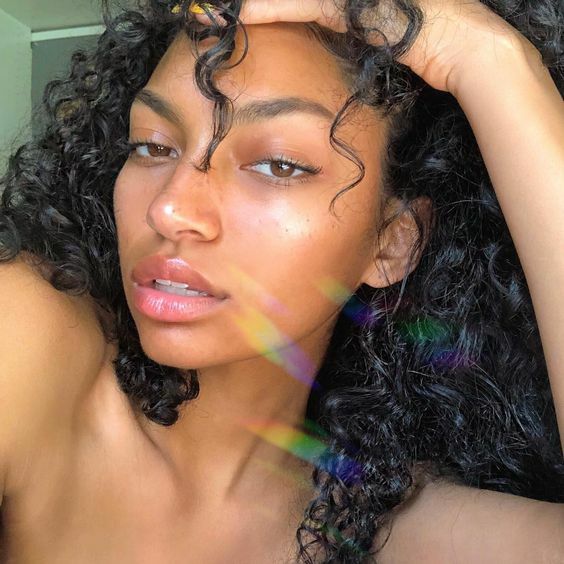 It wasn't long ago that I stumbled on a genius hack that allows us to instantly create a DIY shimmering body oil not unlike Fenty's Body Lava. I've been known to make impulsive beauty purchases from time to time. But lately, I've been so impatient that I often resort to making a quick at home version compiled from what I already own. Just this past week, I was introduced to a new skin enhancing product that I absolutely had to have. It all started when I was tagged in the comments of a post on Instagram. Little did I know that I was about to discover my newest favorite summer skin essential. When @ellisonja tagged me asking what I thought about a product called "Skin Glass," I was a bit caught off guard because I'd never heard of the brand before. Soon I discovered that Skin Glass was the brainchild of professional makeup artist and woman of color. Essentially, skin glass is a blend of oils that illuminate the skin and give it a "magical reflection." It gives the skin a subtle (non-greasy) glow. Sounds amazing.....I instantly wanted it. After checking out their website, I discovered 3 things. 1. Skin Glass keeps selling out. 2. Skin Glass is $38.00 for a 1 oz bottle. 3. Skin Glass could be replicated if we have the right products at home. The original formula combines a blend of avocado, need, jojoba and grapeseed oil in one. The secret sauce that makes skin glass magical is the addition of mica powder to provide the shimmery glowy skin that we all want. I thought to myself..."I have mica powder. I have facial oil. Why can't I quickly recreate a dupe?" So I did. My powder of choice is a loose highlighter that is finely milled to perfection. It melts wonderfully into any liquid foundation or oil. For my first experiment, I blended a little rosehip oil, some powdered highlighter and voila! The shimmery face oil melted into the highpoints of my cheekbones. I grinned from ear to ear after realizing that I formulated my own version of a highlighter facial oil only minutes after knowing that this product existed. From here, I'll experiment with various other oils like maybe squalene. And, for a little more coverage, I can add foundation as the third ingredient. Oh, by the way, my finely milled powdered highlighter of choice from Eye M Glam. I learned of this product years ago from a celebrity makeup artist who purchased after learning that another MUA used it on his biggest celebrity clients. This stuff is so yummy. It's a beautiful rose gold-ish hue that looks amazing on deep skin tones. I brought some with me once to get my makeup done professionally and the girl doing my face instantly wanted to purchase some for her kit. It's good stuff y'all.